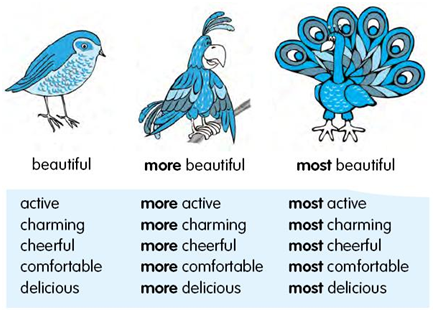 Comparative and Superlative Adjectives- Do you know enough? An adjective is a word that describes a noun. It is a part of all the global languages, except the Bantu ones. The derivation of adjectives depends upon the number of syllables. There are many types of adjectives like comparable, non-comparable, attributive, predicative, absolute, nominal, comparative, superlative etc. 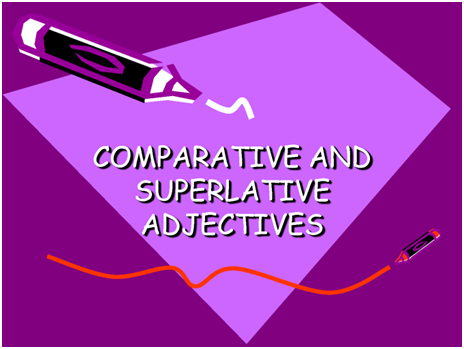 This post will concentrate on Comparative and Superlative Adjectives. When two people or things are compared, comparative adjectives are used. The words will change depending upon the syllables of the words. 1. Ramesh is taller than Mitesh. 4. Rihanna is more famous than Madonna. 5. The movie is more interesting than the previous one. 6. The ship is larger than the boat. 7. Rajat is wiser than Sanjeev. 8. Suja is nicer than Suma. 9. I find her more attractive than others. 10. I have never been happier. 1. If the adjective has only one syllable, then the letters 'er' is added. 2. If the adjective has two syllables or more, than the word 'more' is usually used. Example: more famous, more joyful. 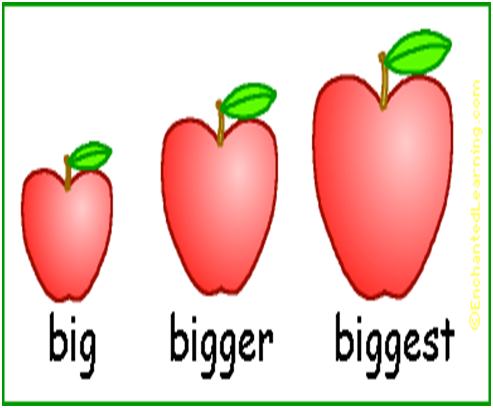 When one person in a group is compared to every other member, superlative adjectives are used. As in comparative adjectives, the words will change as per the number of syllables. 1. She was the tallest girl in the class. 2. Chicago is the warmest region. 3. Sheila was the quickest in solving the sum. 4. This is the latest album. 5. The Yamato was the largest battleship. 6. The Eiffel tower is the most famous of all landmarks. 7. This day will be the saddest one of my life. 8. Neeta's room is the tidiest. 9. December is the worst month of the year. 10. It will have the most impact. 1. If the adjective has one syllable, then the letter 'est' is added. 2. If the adjective has two syllable or more, then 'st' or 'most' is used. Example: most careful, most pleasant. Answers: 1. Finer, 2. Lighter, 3. Laziest, 4. solidiest, 5. sadder 6. Most beautiful, 7. Hotter, 8. Most extreme, 9. Better, 10. heaviest. You can find more examples in free online English learning materials. Practice them with the help of an online English guide. 1. How to Avoid Common Grammar Mistakes - I?